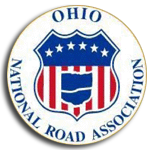 The sixth and seventh Ohio National Road Interpretive signs were unveiled on July 14, 2010. 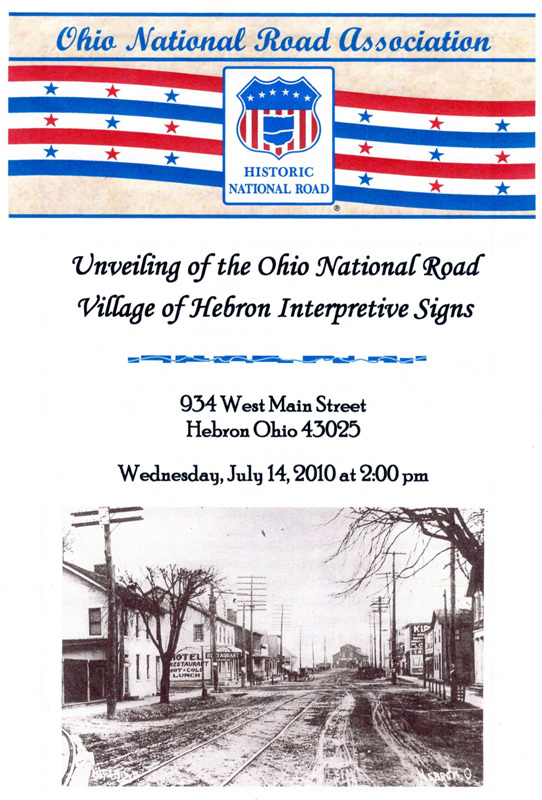 These signs, commemorating the history of the Village of Hebron and the old Hebron Mill, are currently displayed on the north side of the street in the Hebron Municipal Building at 934 West Main Street (U.S. Rt. 40) in Hebron, Ohio 43025. 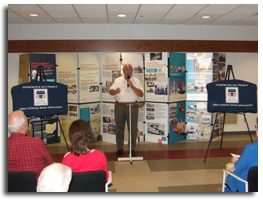 Shown in the background are the Ohio National Road Display panels, which were set up in their lobby at the time of the unveiling. Village Administrator Mike McFarland is shown greeting attendees including (not pictured) Union Township Trustee Rick Black, Hebron Village Council members Jim Friend and Pam DeVaul, Hebron Mayor Clifford L. Mason, and Administrative staff members Andie Myers and Linda Nicodemous. 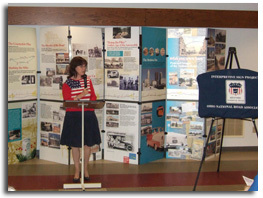 Pictured is ONRA President Cyndie Gerken who spoke about the Interpretive Signage Project. She thanked attendees including ONRA Board members (not pictured) Charla Devine, Larry Bicking, Doug Smith, Mary Ellen Weingartner, and Mike Peppe, as well as staff member Louis Agresta for their attendance at the ceremony. 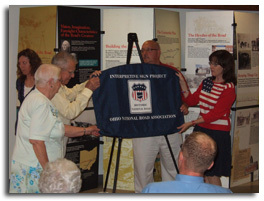 Shown assisting in the unveiling of the Hebron Interpretive sign were (left to right): Hebron Historical Society members Betty McCullough and Dave Morrow, Village Administrator Mike McFarland and Ohio National Road Association President Cyndie Gerken. 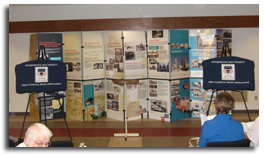 Other members of the Hebron Historical Society in attendance (not pictured) were: Mr. and Mrs. Drushal, Norma Lewis, Margaret Walters, Jean Winchell, Chuck Bachman, Dolores Curnutte, John Winchell, Roland McCullough, Charla Devine, Marsha Justice, Carolyn Creiglow, Tina Hoermle, Annette Price and Ada Mae Penick. 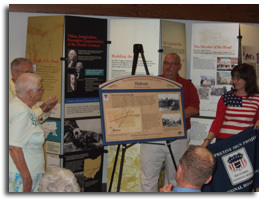 The Hebron Interpretive sign was unveiled to everyone’s delight. The sign illustrates the village’s history as a transportation crossroad. 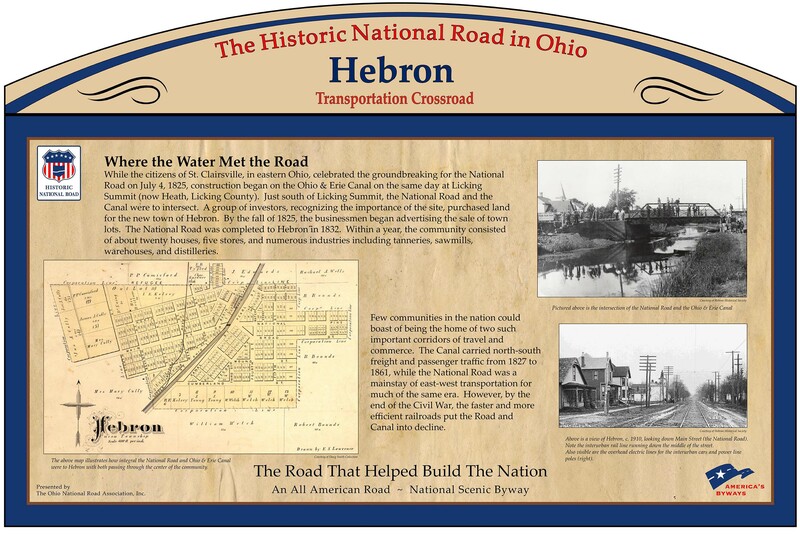 Ground was broken for both the National Road and the Ohio & Erie Canal on July 4, 1825, and Hebron was the only location in which these two corridors of travel and commerce crossed. 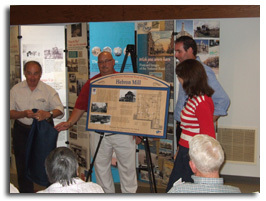 The Hebron Mill Interpretive sign was unveiled by (left to right) ONRA Signage Committee Chair Mike Peppe, Hebron Village Administrator Mike McFarland, current mill building owner Luke Baus, and ONRA President Cyndie Gerken. Mr. Baus expressed appreciation on behalf of his company, Project Architecture/Project Construction which is housed in the old Hebron Mill building. 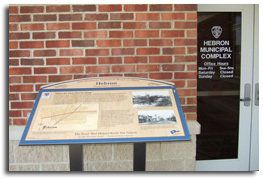 The Hebron Interpretive sign has been installed by the door to the Administrative offices of the Village of Hebron. The entrance is located at the rear of the building located at 934 West Main Street in Hebron, OH 43025. 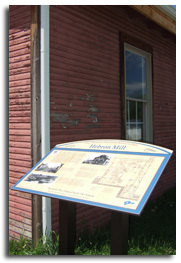 The Hebron Mill Interpretive sign has been installed near the east side of the old Hebron Mill building, located at 149 East Main Street in Hebron, OH 43025.